With both of these teams sitting on three points after two games, occupying third and fourth spot in the group, this is likely to be a hugely important game in the shake-up of the group. While both teams will be confident about progressing from this stage, the US and Australia could move out of reach for the team that loses, and the defeated team will start looking nervously over their shoulder. This places a huge emphasis on the game which should make it an intriguing one for basketball fans tuning in from around the world. 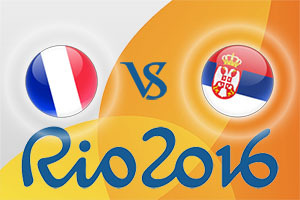 The French come into this game on the back of a win against the Chinese team. Nando De Colo was a key player for the French side in that game, grabbing a total of 19 points in the win that finished 88-60 in favour of the Europeans. It won’t be as simple or as straightforward today for the French but if De Colo hits form, they’ll have a great chance of clinching a big win. Serbia come into this game on the back of a loss to Australia. There is no shame in losing to an Australian side that are showing great form but it would have been a game that Serbia would have fancied their chances in. One key player in that game for Serbia was Miroslav Raduljica who delivered 25 points in the defeat. There have been some big score-lines in Group A but the bookmakers don’t think there will be much between these two teams. This is why taking France at -3, at odds of 1.90 is likely to be a good bet for this vital Group A game. If you are looking at the Over/Under market, look to go OVER 158.5, which you can find at odds of 1.90, and hope that both teams go all out for the victory that will give them a good deal of breathing space for the rest of the group stages. Bet Now! The Race to 20 Points bet looks to be a close run thing and you can back Serbia at 1.68. If you fancy Serbia to have a strong start and take the first half while France rally and clinch the game, you can back Serbia half-time, France full-time at odds of 7.50. Serbia are also backed to be the team that grabs the highest scoring quarter but odds of France at 2.10 could be of interest. The game starts at 1815 BST on Wednesday 10th of August.